Last Wednesday, Hannah from the licensing team attended the annual encaenia ceremony at the Sheldonian Theatre in Oxford. 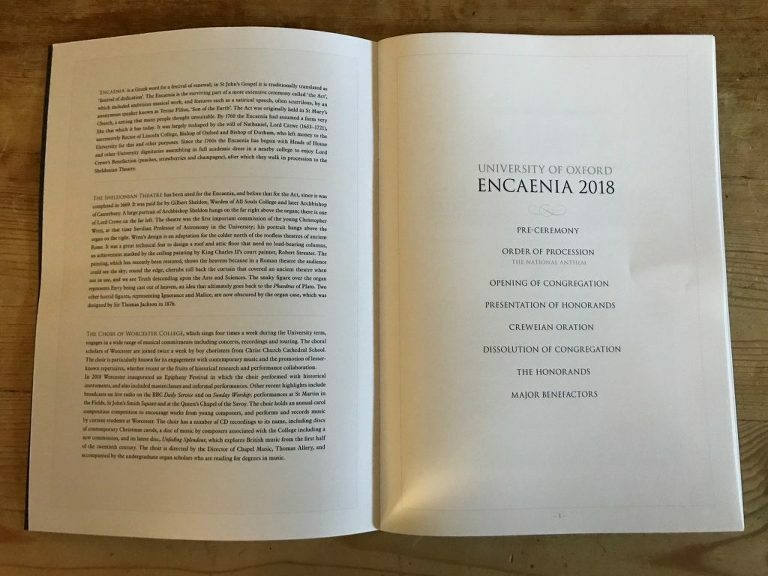 Encaenia is the ceremony at which the University of Oxford awards honorary degrees to distinguished men and women and commemorates its benefactors. This year’s honorands included The Raging Bull and Taxi Driver director Mr Martin Scorsese and classics professor and TV presenter Dame Mary Beard, along with ballet choreographer Sir Matthew Bourne, ex-Supreme Court head Lord David Neuberger, social studies expert Professor Helga Nowotny, leading Harvard scholar Professor Robert Putnam (looking very smart in a University tie), and distinguished economist Lord Nicholas Stern. With vertigo in check, Hannah watched the ceremony from the upper gallery of the Sheldonian. Even the Latin presentations proved entertaining and raised a congregational laugh or two. Not being fluent in Latin, Hannah was thankful for the English translation provided in the programme! Honorary degrees received from the Chancellor, the six stars of the show processed out into the sunshine in their ceremonial robes and caps to face the curious tourists and lunch at All Souls followed by a garden party hosted by the Vice-Chancellor.